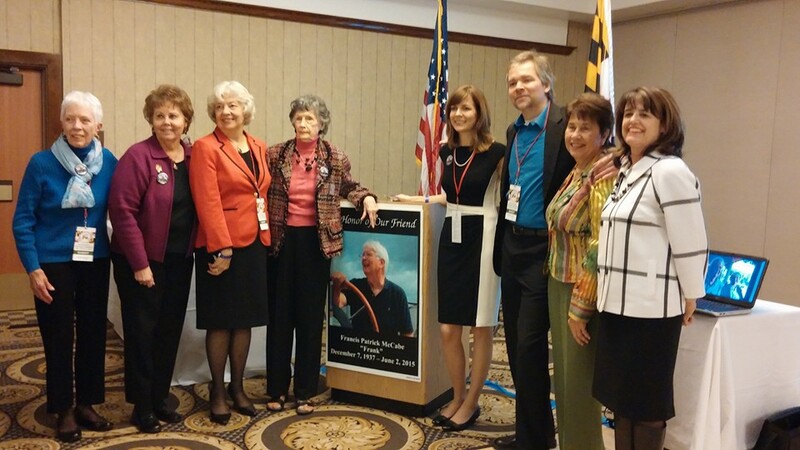 The Maryland Republican Party honored and celebrated the life of Frank McCabe on Saturday, November 21, at the closing reception of the fall MD GOP Convention in Solomons. Family and friends of Frank, who lost his battle with cancer this past June, came together to remember and announce the FRANK MCCABE MEMORIAL LEADERSHIP FUND. This Fund will help Republican candidates and campaign staff around the State of Maryland with scholarship monies to attend classes, workshops, hold seminars, etc. Applications are found on this website. Details of eligibility are found on the application. A well attended reception hosted by the Fund Committee and the MD GOP offered remarks on Frank's life, beginning with MD GOP Chairman Diana Waterman who recalled Frank's help many times. Delegate Tony O'Donnell related how Frank and Nancy McCabe offered their help to him in the early 90s when he first decided to run for the Delegate seat in Southern MD. He gave many examples of Frank's accomplishments for the Party. Nancy McCabe graciously told the story of Frank's interest in the political scene in Virginia and later in Maryland and how he changed the landscape of the political parties in both areas. Both Tom and Kelly, the McCabe children, spoke lovingly of their father. Judy MacWilliams introduced the Fund Committee and offered remarks on the estabishment and background including the introduction of Nell Bowen, the generous benefactor of the Fund who has offered a matching fund requirement. Judy explained that application process that will begin in the summer of 2016 with funds being granted in the fall of 2016. At the Reception, Calvert County Central Committee Chairman Greg Ostrander also gave remarks on Frank's legacy and presented a check in the amount of $500 to the fund in memory of Frank on behalf of the Central Committee.